NOTE: included here are programmable coffee maker as well as switch (regular, non-programmable) coffeemaker reviews of Mr. Coffee® machines only. For coffeemakers of different brands, please navigate on the NavBar to the left under the Brand title. For Mr. Coffee Grinders, check out Mr. Coffee electric coffee grinders. For reviews on Mr. Coffee Permanent Coffee Maker Filters, check out reusable coffee filters - Mr. Coffee. Mr.Coffee is one of the leading popular brands of low-end everyday coffee makers for home and office. They offer both programmable as well as non-programmable coffee makers, some of which are reviewed or referred to below on this page. The coffee maker reviews here include some basic coffee makers without programmable features, as well as programmable coffee machines of various capacities, including 5-cup and several models of Mr. Coffee's 12 cup programmable coffe makers, differing in design and features and ranging in different prices. MrCoffee also offer thermal coffee makers and higher-priced single serve coffee makers similar to Keurig's single serve coffee machines. Includes basic programmable features: clock, programmable timer, on-off light-indicator, warming plate, 1-hour auto shut-off, Pause-'N-Serve, dual water-level window, beeps when done brewing. Has a small glass carafe. Takes permanent or paper filter; make sure reusable filter is included if advertised. Read more about this 4 cup Mr Coffee DRX5 programmable coffee-maker. The MrCoffee TF5 switch coffee maker is a basic regular coffee maker. Price is somewhat cheaper than the programmable. Read more about the TF5 4 cup Mr-Coffee Switch coffeemaker here. Like the 4 cup coffeemaker, this one is small and compact, ideal for one (or 2) person in home, office, or for travel. It is also priced about the same as the 4-cup coffee maker. The JWX9 coffeemaker is not fully programmable, however. It does feature a programmable timer, but it lacks an automatic shut-off. It includes a stainless-steel carafe, which is more durable. The drawback is that you can't see through it to determine how much water or coffee is in there. The water chamber of the coffee machine has dual see-through windows with water-level indicators. 4 Cup or 5 Cup? Here are the differences between the 4 cup and 5 cup programmable Mr. Coffee Coffeemakers mentioned above. 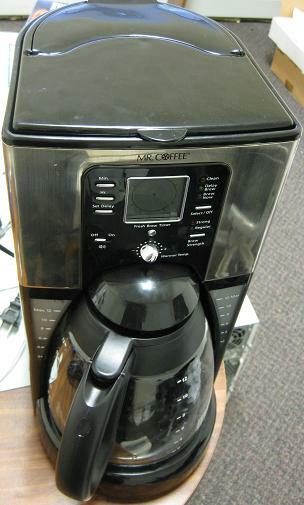 Mr. Coffee has several different 12 cup coffeemakers on the market, including switch and programmable coffeemakers. 2 of the popular 12 cup coffeemakers are reviewed here. I own them both and have tried and tested them. In my opinion, they are among the better 12 cup coffee brewers in the market, both in terms of look and design, as well as functionality and quality. The BVMC-SJX33GT 12 cup programmable coffee maker (the image here on the left is actually from the BVMC_EHX23 model that I own; it appears to be almost identical to the a.m. model, but is hard to find around, so am referring here to the a.m. coffee maker, but the comments pertain to the latter one as well) brews 12 5-oz cups of coffee. Read a review and watch a video comparing this Mr.Coffee vs. Black-&-Decker's DLX1050B 12 cup coffeemaker. It features a programmable timer to brew coffee automatically at a later-set time; strength settings for weaker and stronger coffee, auto shut-off after 2 hours; heating element keeping your coffee warm for 2 hours; pause-&-serve to sneak out a cup before brew completion; shower-head to distribute brewing water evenly over the coffee grounds for better flavor extraction; see-through water-chamber window with water-level markings. It beeps 3 times to let you know the brew is done, as well as when shutting off after 2 hours. The coffee maker makes hot -- although not lip-scalding! -- and good tasting coffee. It is priced higher than the 4- and 5-cup coffeemakers, around $40. I fully recommend it as an everyday low-end coffeemaker. At first use, and also as time goes on, you may need to clean the coffeemaker and run through vinegar cycles to improve taste, quality and temperature. A downside of this programmable coffee maker is that the control panel is too elaborate and may be overwhelming and confusing for first users. Nonetheless, the Mr.Coffee manual explains it all and it's easy to get used to. Read a more extensive review, as well as instructions on using this 12 cup coffee maker here. This programmable 12 cup coffee maker is like an upgraded version of the one mentioned above. It includes similar controls, with the addition of a water filter, temperature controls allowing to increase or decrease the heating degree of the water. It beeps 5 times when the brew is finished, and it features an on-off switch to turn off the beeping. It also has a Clean function. The Shower Head is one piece with the lid of the coffee maker, so no need to turn it over the grounds and it doesn't hold back the lid from closing. The design of this model is more attractive and handsome than the a.m. one, but it allows visible finger-prints because of the stainless finish. It has dual water-level marked see-through water-chamber windows, nicely complementing the carafe in front of the machine, as opposed to the a.m. one that has only one window. A shortcoming, like the one reviewed above, is the overwhelming control panel. More drawbacks of this model are that because of its elegant shape and design, it is hard to get the last bit of coffee out of it without spilling. Also, it is hard to pour in the water in the water-chamber because of the narrower opening, as compared with the a.m. one who's chamber-opening is more ample. This problem is omitted, however, when filling it through the water-filter that spans the whole width on the posterior top of the machine. Using a paper filter, it does not fit in and cling to the sides of the filter holder as well as the a.m. programmable coffee maker, but I didn't experience a problem of the filter folding over as a result of it. Some people are complaining of problems with the clock resulting from the steam ascending from the carafe because of its stylish design; I personally didn't have a problem with that. This programmable coffee maker is more expensive (I guess about 10 bucks more or so) than the a.m. one. If you appreciate its superior design and added features, as pointed out above, and you're ready to add the extra dollars, go for it. Also, if you like really hot coffee, this one may be a better choice than the above mentioned programmable coffee maker. A more detailed description, as well as a side-by-side comparison between the two 12 cup programmable Mr. Coffee makers read here. 4 Cup or 12 Cup? If you are looking primarily for a low-capacity, compact, small-footprint, space-saving small coffeemaker, the 4 cup coffee maker may be better for you, especially if you are a conservative coffee-consumer. The 4-cup also is more suited for travel because of its smaller size. Note that besides the difference in the amount of controls and features, the 4 cup coffeemaker shuts-off after 1 hour, while the 12 cup heats your coffee for 2 hours. Also, the FTX41CP 12 cup coffeemaker makes hotter coffee than the 4 cup coffeemaker. The 4 cup machine is also more affordable than the 12 cup, much more than the FTX41CP model. On the other hand, if you're looking for a higher-capacity coffeemaker, if you drink a lot of coffee, or have multiple coffee-drinkers at your location, and you also want to take advantage of all the added features and controls, then you may decide to choose the 12 cup programmable coffee maker. Especially if you like your coffee really hot, you'll want to go for the FTX41CP 12 cup model. The trade-off? Space and price. The 12 cup coffeemakers have a larger footprint. They take up more space and are priced higher than the 4-cup or 5-cup small coffee makers. Read more 12 cup coffee maker reviews here.